Gabrielle Funk is a Winnipeg based visual artist and muralist. She works primarily in two dimensional format using combinations of ink and acrylic to render densely detailed characters imbedded in sparse, abstract environments. Gabrielle creates realist portraits that walk the line between the awkward and graceful, the familiar and foreign. She aims to beckon viewers into a world laced with quiet tension and subtle admission, seeking to find and represent the face of vulnerability and the essence of authenticity using subject matter and symbolism that is as hostile and wild as it is familiar. 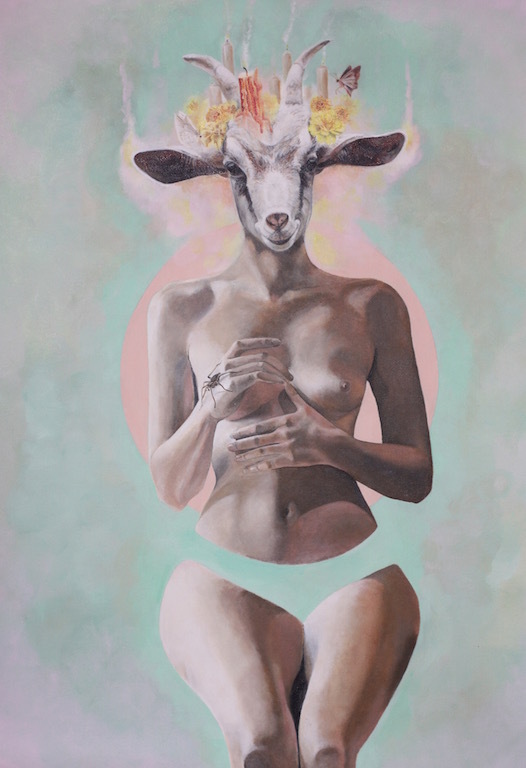 Through her current work Gabrielle is grappling with the complex subtleties of femininity as a societal construct by comparing, contrasting or combining the vulnerable images of women’s bodies with those of culturally significant animals. This work carefully and critically addresses the physical and psychological dynamics of wild and domesticated beings and the power hierarchies that exist amongst them.